Thursday was Thanksgiving in the USA, a day for being grateful for everything we have. 2016 was a year of ups and downs, but the one consistently positives thing through the whole year was the wonderful readers I have met in my last year of publishing. I am so grateful for all of you! As you may recall, last month I put two short stories up for free download on InstaFreebie. This turned out to be such a success that I decided I wanted another way to thank you all for your support, and give more back to you. So today I am resurrecting an old story from beyond! I usually talk about “The Choice” being my first published short story, but that’s actually not 100% true—it’s just the first story I released under this pen name. I had another story published under a different pen name about a year prior, in a short-lived online journal of sci-fi romance. After that went out of print, the story just sat on my hard drive with me unsure of what to do with it. That story was “Star-Heart,” originally published under my old pen name Alyssa Altadonna, and I’m so excited to be bringing it back out from the vault! You can now read the story for free by downloading your copy from InstaFreebie. This link isn’t going public until December 1, but I wanted to share it with you now as my way of saying, “THANK YOU!” You can learn more about the story, including a brief excerpt of one of my favorite scenes, below! Kimber is a dreamer. Even though her old-fashioned family thinks she should keep her feet on the ground, she’s determined to enter the annual stratos surfing race—a dangerous but exhilarating sport held 120,000 feet over the Earth. When she finds a broken-down stratos board in a trash heap, Kimber suddenly realizes her dream could come true… if she’s willing to put aside her prejudices and accept a helping hand from her arch-nemesis, rich boy Jase Hart. My parents just don’t get it. Their feet are planted firmly in the dirt, just like their precious crops. They don’t care about anything in the sky except for the sun and the rain clouds. When they look up at night, they see nothing but darkness. Pop asked me what was wrong tonight at dinner, as I sulked over my green beans. Deep lines were carved into the tan skin of his face, wrinkling around his eyes. Worry makes him look older than he is, and it seems like he’s been worrying a lot lately. Probably about me. They don’t understand how I feel when I look up at the sky. When I see the pictures in my science books at school. When Hart Enterprises showed all its employees their sim vid of the interplanetary wagon train, I wasn’t looking at the vehicles, or at Mars. I was looking at the constellations. What would it be like, to be up there among them? To fly through the stars? Up in the stratos, surrounded by nothing but the sky and the lights and the galaxy. 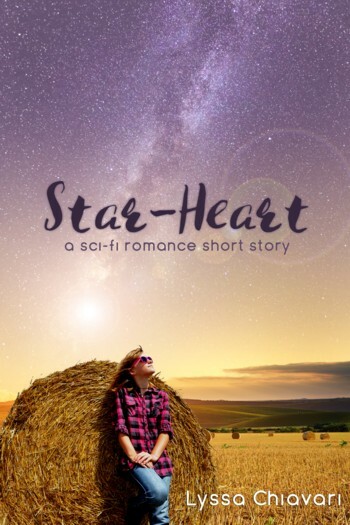 “Star-Heart” is available for free to newsletter subscribers—just fill out the form on InstaFreebie and they’ll send you your copy in whatever ebook format you prefer! This offer is open to both current subscribers and new ones, so just head on over and let IF do the rest.